Thank you to Chulmleigh Golf Club for your recent generous donation of £215 raised at their recent "One Club Challenge". Thank you again your support, it really does make a difference. Devon currently has 53 volunteer Community First Responders Groups and 15 Co-Responding Fire Stations of Devon & Somerset Fire & Rescue [DSFR]. These are all trained to attend a wide range of emergency calls in their local neighbourhoods and to provide essential life saving treatment like CPR and defibrillation whilst an ambulance is en route. Their early intervention is invaluable, especially in rural and remote areas where early treatment is beneficial in ensuring the best outcome for patients. DART aims to support these groups in all the villages and towns of Devon with a population of over 1000. We will do this by enlisting local champions who we will assist in fund-raising so that each area can be by provided with additional resources and equipment. 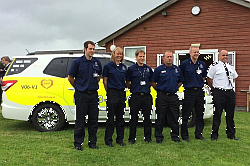 In Chulmleigh we have provided a 4x4 and other equipment and we fund approximately half of the running costs. DART has a five year plan to extend their support to all ambulance first responders, in both community and co-responding groups across Devon. DART will assist in fundraising for these groups and promote their work in order to maintain public awareness and encourage continued support. You can make a valuable contribution to your local community by becoming a Community First Responder, joining DSFR or by making a donation to your local group now.